By adolescence, your brain already contains most of the neurons that you’ll have for the rest of your life. But a few regions continue to grow new nerve cells—and require the services of cellular sentinels, specialized immune cells that keep the brain safe by getting rid of dead or dysfunctional cells. Now, Salk scientists have uncovered the surprising extent to which both dying and dead neurons are cleared away, and have identified specific cellular switches that are key to this process. The work was detailed in Nature on April 6, 2016. 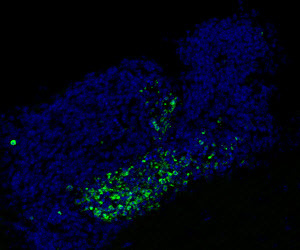 Two decades ago, the Lemke lab discovered that immune cells express critical molecules called TAM receptors, which have since become a focus for autoimmune and cancer research in many laboratories. Two of the TAM receptors, dubbed Mer and Axl, help immune cells called macrophages act as garbage collectors, identifying and consuming the over 100 billion dead cells that are generated in a human body every day. For the current study, the team asked if Mer and Axl did the same job in the brain. Specialized central nervous system macrophages called microglia make up about 10 percent of cells in the brain, where they detect, respond to and destroy pathogens. The researchers removed Axl and Mer in the microglia of otherwise healthy mice. To their surprise, they found that the absence of the two receptors resulted in a large pile-up of dead cells, but not everywhere in the brain. Cellular corpses were seen only in the small regions where the production of new neurons—neurogenesis—is observed. When the researchers more closely examined this process by tagging the newly growing neurons in mice’s microglia missing Mer and Axl, they noticed something else interesting. New neurons that migrate to the olfactory bulb, or smell center, increased dramatically without Axl and Mer around. Mice lacking the TAM receptors had a 70 percent increase in newly generated cells in the olfactory bulb than normal mice. How—and to what extent—this unchecked new neural growth affects a mouse’s sense of smell is not yet known, according to Lemke, though it is an area the lab will explore. But the fact that so many more living nerve cells were able to migrate into the olfactory bulb in the absence of the receptors suggests that Mer and Axl have another role aside from clearing dead cells—they may actually also target living, but functionally compromised, cells. This isn’t necessarily a bad thing in the healthy brain, Lemke adds. The brain produces more neurons than it can use and then prunes back the cells that aren’t needed. However, in an inflamed or diseased brain, the destruction of living cells may backfire. The Lemke lab did one more series of experiments to understand the role of TAM receptors in disease: they looked at the activity of Axl and Mer in a mouse model of Parkinson’s disease. This model produces a human protein present in an inherited form of the disease that results in a slow degeneration of the brain. The team saw that Axl was far more active in this setting, consistent with other studies showing that increased Axl is a reliable indicator of inflammation in tissues. “It seems that we can modify the course of the disease in an animal model by manipulating Axl and Mer,” says Lawrence Fourgeaud, a co-first author on the paper and former Salk research associate. The team cautions that more research needs to be done to determine if modulating the TAM receptors could be a viable therapy for neurodegenerative disease involving microglia. Other researchers on the paper were Yusuf Tufail, Humberto Leal-Bailey, Erin D. Lew, Patrick G. Burrola, Perri Callaway, Anna Zagórska and Axel Nimmerjahn of the Salk Institute; and Carla V. Rothlin of the Yale University School of Medicine. The work was supported by the National Institutes of Health, the Leona M. and Harry B. Helmsley Charitable Trust, the Howard Hughes Medical Institute, and the Nomis, H.N. and Frances C. Berger, Fritz B. Burns, HKT, Waitt, Rita Allen, and Hearst foundations. Microglia are damage sensors for the central nervous system (CNS), and the phagocytes responsible for routine non-inflammatory clearance of dead brain cells1. Here we show that the TAM receptor tyrosine kinases Mer and Axl2 regulate these microglial functions. We find that adult mice deficient in microglial Mer and Axl exhibit a marked accumulation of apoptotic cells specifically in neurogenic regions of the CNS, and that microglial phagocytosis of the apoptotic cells generated during adult neurogenesis3, 4 is normally driven by both TAM receptor ligands Gas6 and protein S5. Using live two-photon imaging, we demonstrate that the microglial response to brain damage is also TAM-regulated, as TAM-deficient microglia display reduced process motility and delayed convergence to sites of injury. Finally, we show that microglial expression of Axl is prominently upregulated in the inflammatory environment that develops in a mouse model of Parkinson’s disease6. Together, these results establish TAM receptors as both controllers of microglial physiology and potential targets for therapeutic intervention in CNS disease.